Special edition, 11 x 14 in. / 160 pgs / illustrated throughout. This limited edition of 25 copies includes a silver gelatin print, numbered and signed by Goldes. 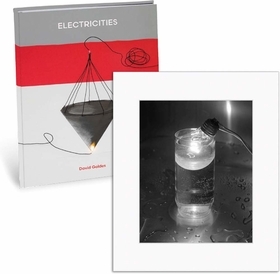 Electricities gathers photographs by Minneapolis-based multimedia artist David Goldes (born 1947) that depict constructions Goldes refers to as “performing still-lifes,” based on historical experiments with electricity. 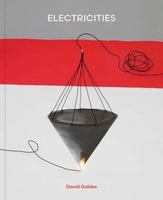 Electrical phenomena including electrostatics, high-voltage arcing, Faraday’s first transformer, water conductivity, electrified graphite drawings and other inventions and experiments form the basis of these works. Goldes uses commonplace materials such as string, pins, wire, pencil lines and bright colored backgrounds. The photographs reveal how electricity jumps gaps, repels, attracts, arcs, destroys and often confounds our expectations. Introduction by Kay Ryan. Conversation with David Campany. FORMAT: Special edition, 11 x 14 in. / 160 pgs / illustrated throughout.